Magnesium is one of the most abundant minerals in seawater. Extracting magnesium from seawater could reduce cost of this mineral, resulting in positive implications for industries that use it. This book addresses mineral process engineering with emphasis on magnesium and provides practicing engineers and students with comprehensive knowledge on magnesium and how it is extracted from seawater and magnesium ores. It takes a chemical engineering approach as separation of magnesium from seawater involves the application of the powerful science of chemistry and transport phenomena principles. This monograph discusses magnesium resources and occurrence, includes an exploration study on deriving magnesium and mineral salts from seawater, and features coverage of magnesium chloride. 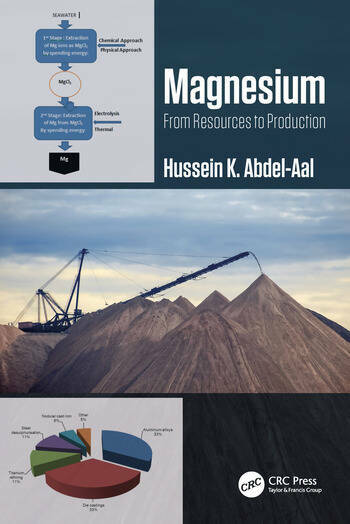 It also covers commercial methods for magnesium production as an end product, current and prospective applications in the energy domain, and offers an account of the use of magnesium to store hydrogen in the form of magnesium hydride. Hussein K. Abdel-Aal is Emeritus Professor of Chemical Engineering and Petroleum Refining, NRC, Cairo, Egypt. He received his BS in Chemical Engineering in 1956 from Alexandria University and MS and PhD in Chemical Engineering in 1962 and 1965, respectively, from Texas A&M University, College Station. Prof. Abdel-Aal joined the Department of Chemical Engineering at KFUPM, Dhahran, Saudi Arabia (1971–1985). He was the head of department for the period 1972–1974. He was also Visiting Professor with the Chemical Engineering Department at Texas A&M (1980–1981). In 1985–1988, he assumed the responsibility of the head of the Solar Energy Department, NRC, Cairo, before rejoining KFUPM for the period 1988–1998. Prof. Abdel-Aal conducted and coordinated projects involving a wide range of process development, feasibility studies, industrial research problems, and continuing education programs for many organizations, including Suez Oil Processing Company, Petromin in Riyadh (Saudi Arabia), Arab Petroleum Investment Corp in Dhahran (Saudi Arabia), Hagler-Baily & Company, Washington DC, Mobil/Esso oil companies in Libya, and Kuwait oil companies. Prof. Abdel-Aal has contributed to more than 90 technical papers, is the editor of the book Petroleum Economics & Engineering, Third Edition, and is the main author of the textbook entitled Petroleum and Gas Field Processing, Second Edition Both books were published by Taylor & Francis Group/CRC Press. Prof. Abdel-Aal is a member of AIChE, Sigma Si, and Phi Lambda Upsilon. He is a fellow and founding member of the board of directors of the International Association of Hydrogen Energy.